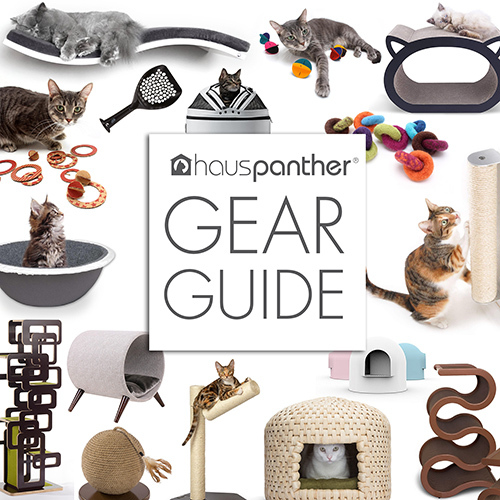 Hauspanther NestEgg & TriPod Cat Lounges Now Available! I’m pleased to announce that two of the new Hauspanther Collection designs are now available! 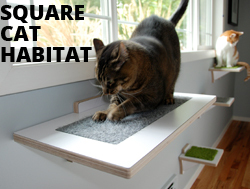 The NestEgg Raised Cat Bed and Side Table and the TriPod Cat Lounge are both available from shop.hauspanther.com. We worked closely with the folks at Primetime Petz to make these two products a reality and we hope kitties everywhere love them! Both the NestEgg and TriPod were designed for kitties who love to sit in sinks (that’s most of them, right?) The clear plastic lounge pod simulates a sink, allowing cats to curl up in comfort. The NestEgg doubles as a side table with sleek hairpin legs for a mid-century modern look. You can also use the pod to grow cat grass or store cat toys. Both the NestEgg and the TriPod are available in white with black legs or black with silver legs. NestEgg is regularly $119.99 but on sale now for $99.o9 and TriPod is regularly $99.99 on sale for $79.99, both including shipping to addresses in the continental US. Attention Cat Campers! Show Me Your Fave Finds From Cat Camp 2018 & You Could Win a Prize! These beds are so cool! I love that you’ve imagined them being used in different ways, too. I think we are just beginning to see the potential here! Thank you for designing these, by the way! I’ve loved the entire Hauspanther / Primetime Petz line, and sink-beds are a perfect addition. We will probably keep both of these items at this price for the foreseeable future! Great idea on the scratcher leg! The table comes with the legs detached, you assemble it with the screws that are included. You could easily wrap one of the legs with sisal! This gives me some great ideas for future products, thank you!! While I love all things to enhance the lives of our feline friends, I’d love to see more items that would fit traditional home decor. (i.e.- Pottery Barn) I realize that mid century and modern is very popular in home decor right now…. I know I’m not the only consumer that still prefers classic looks. – Thanks! Love them! Curiously, what material is the table top? The top is painted MDF. Please let me know if you have any other questions! Any chance of selling these in the UK?My kitties would love them.